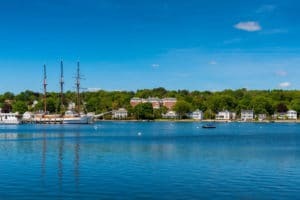 If you want to experience New England in a relaxing small town atmosphere, Mystic, CT is the vacation destination for you. No wonder so many movies have been filmed here: Mystic Pizza and Amistad among many others. But there’s so much more to do than star-gazing. Wondering what to do in Mystic, CT? 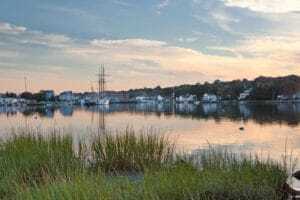 Whether you like to go, go, go or take it slow, there are plenty of things to do in Mystic, CT, all within a short drive from Stonecroft Country Inn. Enjoy the array of activities in Mystic, nearby Stonington, and along the Southeastern CT seashore during your stay at our Mystic, CT bed and breakfast. Explore our favorite things to do in Mystic, CT to start planning your visit today. Be sure to download our Vacation Guide to see even more activities and attractions in Mystic Country, one of the top tourist attractions in CT. This incredible museum of America and the Sea is the nation’s leading maritime museum. Explore American maritime history first-hand at Mystic Seaport Connecticut as you climb aboard historic tall ships, stroll through a re-created 19th-century coastal village or watch a working preservation shipyard in action. Exploring the seaport of Mystic and learning about our fascinating Mystic history is one of the best activities in Mystic! Experience a close encounter with sea life at the Mystic Aquarium & Institute for Exploration, a world-class aquarium and exploration center. Feel the splash from a beluga whale, go beak-to-nose with a penguin or simply marvel at the many varieties of marine life housed here: California sea lions, fur seals, African Black-Footed Penguins, Moon Jellies, Sea Stars, Bats, Unicorn Fish, Blue Tang, Octopus, Leopard Shark, Sheepshead Fish, Horn Sharks, and many other exciting creatures from the oceans of our planet. 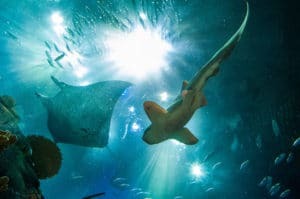 The Mystic Aquarium Connecticut is a favorite among all visitors to our beautiful area, there’s no question why it’s world famous! Try your luck at games of chance, poker, blackjack, and more. Not far from the inn are two stylish casinos offering gambling, entertainment, shopping, and wonderful restaurants, two of the most famous attractions in Connecticut. Foxwoods Resort Casino features championship fights, lounges, theater, and concerts, as well as 380 games of chance, including blackjack, craps, pai gow, and slots. If poker’s your game, Foxwoods is a charter member of the World Poker Tour and home to the World Poker Finals and the Foxwoods Poker Classic with 104 tables. Mohegan Sun offers more than 300,000 square feet of gaming excitement (including smoke-free areas), The Shops at Mohegan, 30 restaurants, food and beverage outlets, live concerts with some of today’s top headliners, and major sporting events including Mohegan Sun‘s very own WNBA team, the Connecticut Sun. Truly the epitome of a quaint, seaside New England town, Mystic village offers hours of strolling charm – not to mention terrific shopping! Some of our favorite retail establishments are at Olde Mistick Village, one of many fantastic Mystic, Connecticut attractions. The rich history and culture of the local Pequot and other native tribes come to life at this new state-of-the-art museum and research center. Experience dioramas and exhibits, films and videos, interactive programs, archival materials, ethnographic and archeological collections, and commissioned works of art and traditional crafts by Native artisans at the Mashantucket Pequot Museum and Research Center. Informative and fascinating, this is by far one of the best museums in Connecticut. The last of an American whaling fleet that numbered into the thousands in whaling’s heyday, the Charles W Morgan was built and launched in 1841, making it the second oldest commercial ship still afloat in America. Only the USS Constitution is older. This ship is worth a visit for history buffs or anyone interested in learning more about the rise of Mystic, Connecticut as an important seaport. 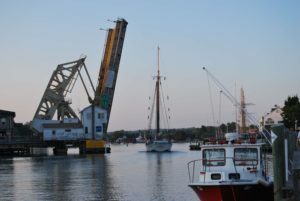 This historic bridge connecting Route 1 across the Mystic River is actually fun to watch in action. Unlike most bridges, its mechanical parts are out in the open, permitting a view of all the action. Be sure to check out this historic landmark while exploring the downtown of Mystic! This waterfront center features 4 galleries of permanent and rotating exhibitions on Water Street in Mystic. The Mystic Arts Center is a wonderful gallery with very helpful and knowledgeable staff and is one of our favorite Mystic, CT attractions. Perfect for hikers and those looking to explore nature, Bluff Point State Park is home to a number of wooded hiking and biking trails. 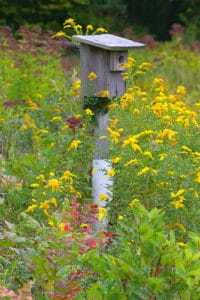 Spend the day walking the trails, observing the wildlife, and taking in the beautiful Connecticut nature. Another wonderful Connecticut state park with a 0.8 mile bike trail that is part of the 7.5 mile town-owned bikeway that snakes from Mystic to Groton, the Haley Farm State Park is worth visiting. Visit the farm for outdoor recreation of all kinds. Known as Connecticut’s largest coastal property managed for wildlife conservation, the Barn Island Wildlife Management Area spans 1,013 acres. The area is home to a very diverse ecosystem with hilly uplands, open fields, mixed hardwood forests, and wetlands. The area perfect for hiking, wildlife observation, and hunting. 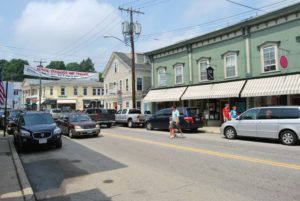 The area is located in Stonington, only a short drive from Mystic. Located in Stonington, at the mouth of the Mystic River, Mason’s Island is the perfect day-trip destination. The island is home to a number of hiking trails and beautiful scenery. Visit the island for swimming, fishing, hiking, and endless fun. Head over to Mystic Pizza, the nostalgic pizza spot that inspired the 1988 coming-of-age film about two sisters who are working as waitresses at the eponymous Mystic Pizza. This is an actual place in downtown Mystic that’s definitely worth checking out! 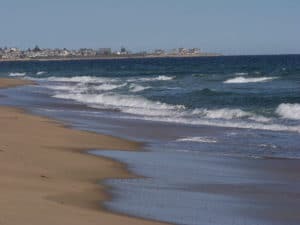 During the warmer months of the year, the beaches near Mystic CT are one of the greatest places to explore and relax, whether you have the little ones in tow, or are just looking for a place to kick back with your current read among the Mystic dunes. 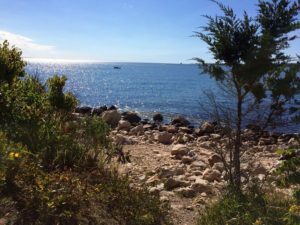 The beaches in our area have more than enough opportunities to enjoy plenty of beach activities in Mystic, CT. This stretch of New England coastline just north of the Long Island Sound is both gorgeous, as well as scattered with wonderful historical sites to enjoy. As befits an old port town, Mystic, Connecticut has more than enough restaurants to satisfy the gourmand in your group! While we’re known for having amazing seafood restaurants in Mystic, CT, there are fabulous Mystic, CT restaurants to suit any taste. Be sure to see our master list of great restaurants near Mystic, Connecticut! 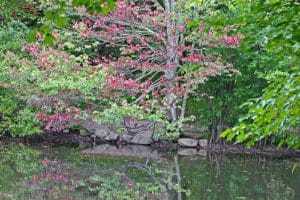 The Denison Pequotsepos Nature Center in Mystic, CT, is one institution, in particular, that is going to great lengths to ensure that the Connecticut wildlife is safe and able to flourish, while educating the public about the importance of helping the environment. Find out what you can expect to see at this fascinating nature center and make plans to visit! Mystic also includes countless places to go shopping. If you want to find the best souvenir while you’re staying in this incredible town, check out the many spots to go shopping in Mystic, CT, on our blog! Still not convinced of all there is to do here in Mystic, CT and the surrounding area? 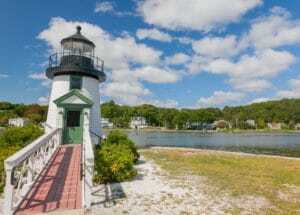 Here are a few articles from our blog that other visitors to our Mystic, CT bed and breakfast found interesting about the various things to do in Mystic, CT.
For even more recommendations on things to do on the other side of Connecticut, be sure to visit the Stanton House Inn, a bed and breakfast in Greenwich, Connecticut, and read their recommendations on things to do in Greenwich, Stamford, and Norwalk, Connecticut! They’re also happy to offer suggestions for Westchester County, New York, attractions, and even things to do in Manhattan! To find out all of the great things to do in Mystic, CT, be sure to download our Vacation Guide! You’ll never be lost with what to do in Mystic, CT during your stay with us.